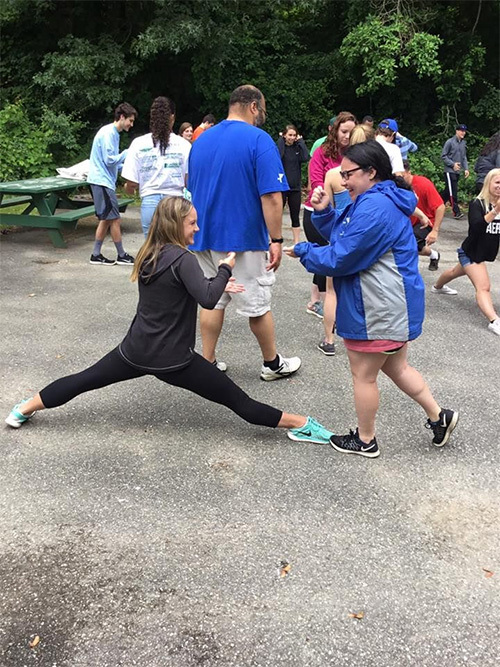 The Greenknoll Branch of the YMCA, using the foundation of experiential education, develops team building programs that can be used by groups such as sports teams, schools, college organization groups, corporations, services organizations even families. Experiential education is when the educator engages with a learner in physical activities that create opportunities for reflection. The goal is to increase self-awareness, develop skills, clarify your values and develop a capacity to contribute to your team or community. Let us show you the ropes by bringing our mobile adventure unit to you. This program is a great way for your organization or corporate group to work on teamwork, developing trust and establishing effective communication or simply getting to know each other. Programs can be tailored to fit the needs of any group, and we can accommodate groups of any size. Unfixed Initiatives- Programs with props available onsite or at our facility. For example, team building with props in the woods, on a football field, or in the gym. These are mobile programs that we can bring to you. Trust Building- Exercises used to develop trust between team members. Orienteering/Bush Whacking- When you use the map and compass to get from point A to B. Bush Whacking includes walking through a terrain. Camp Site Cooking- Learn how to cook on an outdoor fire. Done at Camp Greenknoll or can be done at your location.